“Is it because you don’t love me anymore?” Ah, my husband, always so funny. About a decade and a half ago I was trying to find my culinary style. For the first time in my life I was in charge of cooking for someone else, and that someone else turned out to be somebody from a culinary culture far removed from my own. Luckily my husband, also raised on staples, turned out to be as adventurous as me. We are always willing to give things a try (within reason). Fast forward to today and things have changed considerably. Both our cooking repertoires have evolved significantly, we’ve tried new cuisines, been around a bit (actually, a heck of a lot, in my husband’s case). Things were left behind. This week we had dinner at Noah, a restaurant locals know and like well. One of their dishes, beef on a base of sweet cornmeal, brought memories of our first kitchen adventures as a couple, and how this dish was always a favorite of my meat-lover husband. All of a sudden he noticed I hadn’t cooked this in nearly half a decade, which prompted the question at the top of this post. I think this is one of those dishes that once tried, you’ll definitely add to your own repertoire. It just looks refined, while still being simple and easy to prepare, not to mention that it makes for the perfect dish for potlucks and leftover meals. Think of this recipe as the lovechild of polenta and lasagna. It combines the best of both worlds, but with an added twist: as in many of our dishes, this one combines savory and sweet flavors. For the filling, you can use chicken, vegetables or beef (or just use cheese). Beef should be your first choice though; it just goes well in this combination. For the record, I don’t think there is an ounce of Italian in this dish, it is purely, unadulterated, industrial-grade Dominican. I’d love to hear what you think of mixing savory and sweet ingredients in a meal. By the way, the answer to the question is “I still do”. 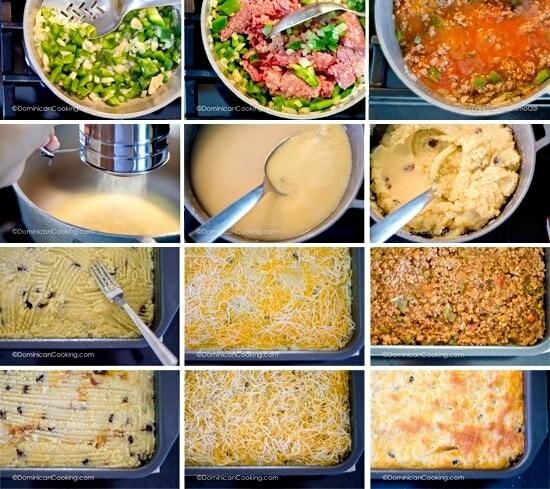 Pastelón de Harina de Maíz Recipe (Cornmeal & Beef Casserole): Think of this as the lovechild of polenta and lasagna. It combines savory and sweet flavors and results are amazing. Heat oil and cook and stir tomatoes, garlic, onion and a pinch of oregano, add water and sugar. Simmer over low heat until you obtain a thick (chunky) sauce. Season with salt to taste. You should obtain about 6 cups of sauce. Set aside. In a skillet heat oil over low heat. Cook and stir the onion, bell pepper, garlic, and oregano. Stir in the ground beef. When the meat starts to release liquid, add two cups of tomato sauce previously made (set aside remaining sauce). Simmer over low heat until most of the liquid evaporates but it is still juicy, Season with salt and pepper to taste. Remove from the heat and set aside. In an iron pot mix in, cornmeal, water, sugar, salt and olive oil. Let it rest for an hour (if possible). Cook over medium heat, stirring constantly. When it comes to the boil lower the fire and continue stirring until it has the consistency of cream cheese and starts lifting from the pot. Remove from the heat. Heat oven to 300 ºF [145 ºC]. Grease a 9" x 9" x 3" [23 cm x 23 cm x 9cm] baking pan. Spread 1/2 of the cornmeal mixture in the baking pan,. Cover it with 1/2 of the cheese, then the meat. Spread the remaining cornmeal mixture and cover with the other half of the cheese. Bake until it turns golden brown. Let it cool for 5 minutes before serving. Garnish with the tomato sauce and serve with green salad (baby arugula with an olive oil vinaigrette is perfect for this). Thanks for sharing your experience. I am glad you liked it. Regarding the size of the pan, I did not specify the depth of the baking pan, the one I had is actually 4 inches deep. I will have to add that to the recipe to avoid this happening to somebody else. It is currently out of print, Michelle, we’re working on a new edition. Well, good luck then. And report back on the result, please. I WOULD LOVE TO HAVE THIS DISH FOR MY FAMILY THANK YOU !! However, does “1/2 grated cheddar cheese” mean half a cup or half pound of it? I love cheese and tend to go overboard with it anyway, but please specify how much you would use.